This is the first beer for me from Trillium’s new Canton location. It is now much easier to get Trillium beer if you don’t mind driving to Canton where there is plenty of parking, tons of employees so the lines are minimal and always a plethora of beer available to purchase. Scaled Up is a very deep orange with an almost murky thickness. I have had thicker beers but this is pushing up against the line of how thick I like my beers. Aroma has loads of tropical fruits which follow through to the taste. Mildly sweet, a light bitter finish and almost no alcohol make for a very enjoyable beer. The 32 ounce growler was probably more than I needed for an 8% DIPA but I enjoyed every ounce of it. Brewer’s Description: The first Double IPA produced at our Canton brewery. Featuring four powerful aromatic hop varieties, Galaxy, Mosaic, Nelson Sauvin, and Columbus, Scaled Up emits dank, spicy, aromas that lead into fruity, citrusy flavors of peach and orange on the palate. 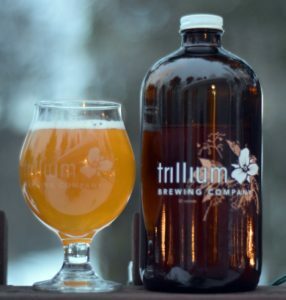 Lighter in body than most of our other Double IPAs, Scaled Up finishes dry and smooth with a pleasant bitterness. 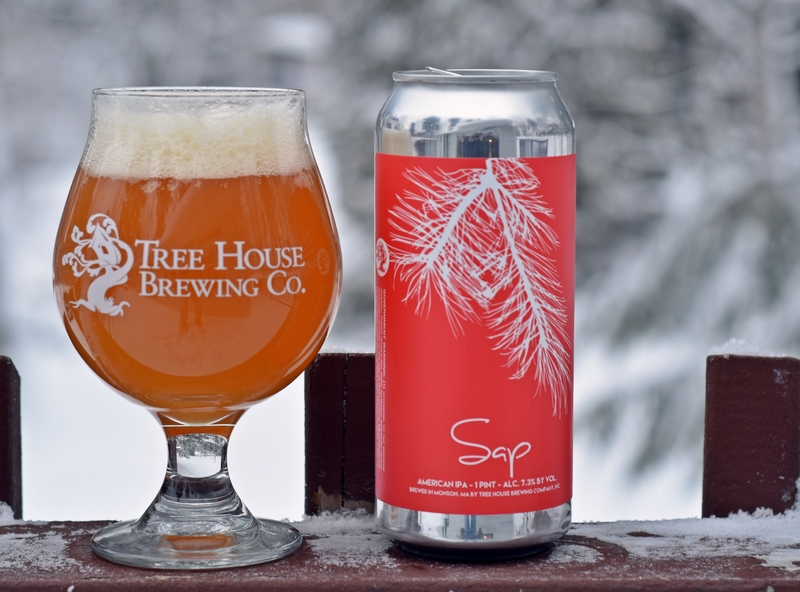 Continuing my run of Tree House beers with Sap. This one is a bit different from the others I have tried from Tree House. With a name like Sap I was expecting a big resinous piney flavor but I can think of several beers that had much more pine than Sap. 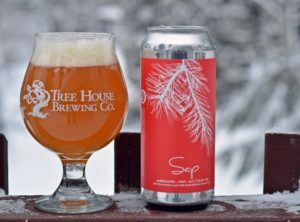 The pour is typical Tree House with a deep orange, thick off white head and a nice haze that is far from see through but not to the point of being murky. Aroma had quite of bit of grapefruit and pineapple but that did not flow through to the taste. Flavor was slightly dank and earthy with a bit of pine in the finish but not nearly as juicy as most Tree House beers. Perfect mouth feel, almost no bitterness and just a hint of alcohol make this a very drinkable beer. Sap is an excellent beer that I would love to drink regularly even though it wasn’t quite what I was expecting given the name. Brewer’s Description: Our IPA brewed with Northwest American hops prominently featuring Chinook! A pungent aroma gives way to a delicate beer loaded with hop flavor. Soft notes of grapefruit, pine, pineapple, and young mango give way to a dry finish making this one hard to put down. We find Sap to be one of our most complex and intricate IPAs – We love it dearly!